Perfect for making a big impression on a budget, our genuine cultured White Freshwater 3-Piece Pearl Jewelry Set is perfect for revving up the drama of both day and evening wear. Our classic White cultured Freshwater pearls are imported directly from the Freshwater pearl farms of China, and have been chosen for their near-round pearl shapes, excellent pearl matching and trademark touchable luster. These gorgeously colored White Freshwater pearls feature a range of pastel overtones from Rose to Silver and Cream/Ivory, flattering to every complexion. Each 3-Piece Pearl Necklace, Bracelet and Pearl Earring set is made exclusively by Pure Pearls for you in our Los Angeles, CA workshop! 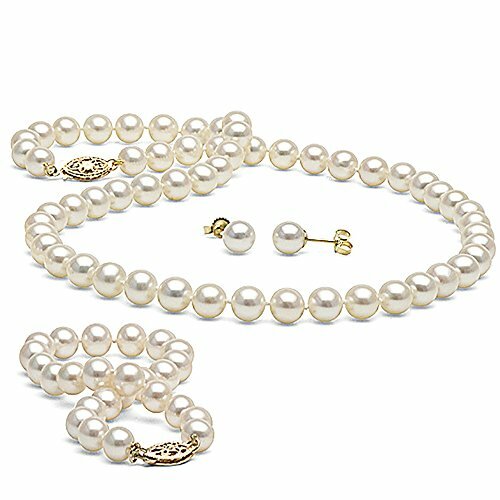 Pearls are individually double-knotted by hand, and finished with a secure and durable 14K Gold Clasp. Your new White Freshwater Pearl Jewelry Set arrives in our Signature 'Little Black Gift Box' and are accompanied by a GIA Graduate Prepared Certificate of Authenticity and special Pearl Care Instructions to help you in keeping your beautiful cultured pearls looking gorgeous for a lifetime! IMPORTED DIRECTLY FROM THE PEARL FARMS OF CHINA, our AA+ Quality Cultured Freshwater Pearls Represent the Top 10% of Each Yearly Pearl Harvest and are Hand-Selected for their Gorgeous Natural colors, Bright and Reflective Luster and Smooth, Clean Surfaces. Pearls are Slightly Ovalish to Off-Round in Shape, and Will Feature Natural Variations Throughout the Strand. Up to 90-95% of Each Pearl is Free of Blemishes.